Boise State's Zach Haney (11) competes with UNLV's Cheikh Mbacke Diong (34) on a jump ball Sat. March 2, 2019, at Thomas & Mack Center in Las Vegas, NV. Boise State has rarely fired on all cylinders this winter, a big factor in its 11-18 record. Two players are central to that storyline tonight in Albuquerque. BOISE, Idaho — Wednesday, March 6, 2019. There have been so many peaks and valleys this season from Zach Haney and RJ Williams, it’s been hard for the Boise State staff to know what to expect. Both players are coming off peaks, though, and the Broncos could use a two-game streak from those two guys tonight at New Mexico. Haney has as few as three games left in his Boise State career and has struggled in conference play. But he equaled his Mountain West season high in points with 13 at UNLV Saturday and was aggressive and confident down low. Williams has also had a tough time in the Mountain West. But he put up 11 points against the Rebels, going without a miss from the field and the free throw line. It was only Williams’ fourth game in double-figures in league action after nine such outings in non-conference play. Keep track of those second-chance points tonight. 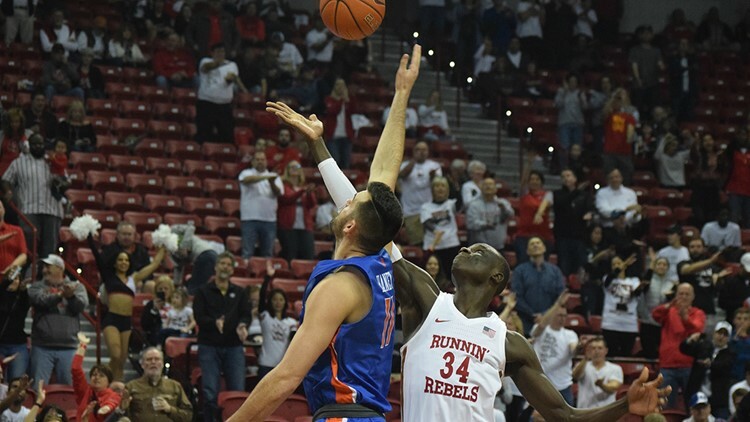 It’s been a periodic problem for Boise State, who was out-rebounded 39-24 in the loss at UNLV. Thirteen of the Rebels’ rebounds came on the offensive end, and San Diego State yanked down 17 offensive boards against the Broncos two weeks ago. Now they face New Mexico, which has rededicated itself to greatness on the glass. And that’s to be expected, as UNM ranks 13th among 353 Division I schools in average roster height. The Lobos may have shockingly lost at San Jose State last week, but they pulled down a whopping 26 offensive rebounds, the most in the Mountain West this season. And they had 17 more in a win over Colorado State last Saturday. Brett McMurphy, Stadium’s College Football Insider, reveals what has to be good news for Boise State and the rest of the Mountain West. We knew that this year would be the conference’s last in the Las Vegas Bowl, as that game moves to the new Raiders stadium next year. McMurphy reports that from 2020-25, the Vegas Bowl will feature the Pac-12 against a rotation of the SEC and Big Ten. But the Mountain West is not left hangin’. McMurphy says there’ll be a new bowl game in the L.A. Rams’ (and Chargers’) palacial new stadium maintaining the matchup between the MW and the Pac-12. The Los Angeles Stadium at Hollywood Park opens in 2020 and will also host the 2023 College Football Playoff title game. As for the other piece of the pretend deal, Aschoff notes: “Dixon was third on the team with 547 rushing yards in 2018 and has a lot of upside. He was an ESPN 300 member in 2018 and would replace outgoing star back Alexander Mattison, who led the Mountain West with 1,415 yards and 17 touchdowns last season.” Well, maybe. But I’m looking forward to Boise State’s running backs battle this spring and summer. As far as newcomers go, who’s to say George Holani or Keegan Duncan won’t be a better fit on this Bronco team than Dixon? It’s not often that a Canadian Football League retirement gets any traction, but former Boise State standout Jerrell Gavins is drawing salutes north of the border. Gavins is retiring from the CFL after four seasons with Ottawa, where he logged 167 career tackles and seven interceptions. He also helped the Redblacks to the 2016 Grey Cup championship. Gavins was a savvy cornerback in his Boise State days and is remembered for his role in the secondary when defensive coordinator Justin Wilcox unveiled a 4-1-6 defense that befuddled TCU in the 2010 Fiesta Bowl. The most memorable play of Gavins’ Boise State career was probably a leaping interception of an Aaron Murray throw in the Broncos’ 35-21 win over Georgia in the 2011 Chick-fil-A Kickoff in Atlanta. If the 2018 season had ended October 1, there’d have been a big ol’ cloud over College of Idaho spring football as it opened Monday on the Caldwell campus. But you know what ended up happening. It’s still hard to believe what the Coyotes did last fall—losing their first five games and finishing with victories in its final six to earn its second straight winning season. The Yotes hit spring with understandable optimism. They have a senior quarterback, Darius-James Peterson, and 10 starters returning on defense. The Purple-Gold Spring game is set for April 6 at Simplot Stadium. There’s momentum on the hardwood, too, as College of Idaho settles into its digs in frigid South Dakota for the NAIA Division II Championships. The Coyotes’ first-round game is Thursday morning versus Voorhees College. This is the Yotes’ 22nd bid to NAIA nationals—the 14th in the tournament’s current Division II configuration—and their third straight. C of I made it to the semifinals last year. Speaking of the format, the tournament is in the second year of a three-year contract between the NAIA and Sioux Falls. The association will then combine the NAIA Division I and II into one division in 2020-21. The Idaho Steelheads will have a new but familiar face on the ice when they return to CenturyLink Arena tonight to host Wichita. The Steelheads have acquired forward Will Merchant from the Greenville Swamp Rabbits in exchange for forward Zach Franko and defenseman Clint Lewis. Merchant played for the Steelies each of the previous two seasons, scoring 38 goals and 94 points in 139 games. But Idaho will be without Steve McParland, who has been loaned to the San Diego Gulls of the AHL. The Steelheads go into the three-game series against the Thunder in second place in the ECHL Mountain Division, two points behind Tulsa and one point in from of third-place Utah. Symbolic of the shift in balance of basketball power in Los Angeles, the L.A. Clippers hand the L.A. Lakers their worst loss in franchise history, 142-94. The Lakers were designated the home team in the Staples Center matchup but were outscored 44-13 in a devastating second quarter. The Lakers, playing all but six games that season without injured superstar Kobe Bryant, would post their worst record ever at 27-55. For the Clippers, it was their most lopsided victory in club history.